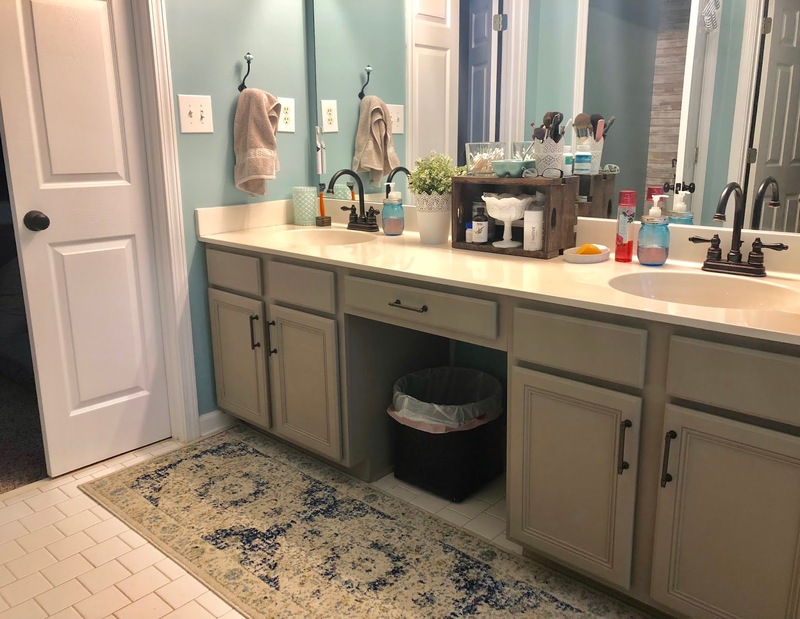 Master Bathroom: we painted the vanity! I'll slow down and start at the beginning. First, to note the elephant in the room- I took a pretty long blogging break! This isn't my first break, but we have been so busy with house projects that I needed to just focus on our stuff. But like I always say after a break- I MISSED BLOGGING SO MUCH! So here I am- and ready to get started...again. So here's where we left the master bathroom. We moved in and pretty much plopped new faucets in. By the way- those faucets are still on Amazon for LESS THAN $40! That's amazing! Oh the oak in this house- so much oak. Oak cabinets in the kitchen, oak floors, every vanity was in oak. It was hard on the eyes and something that needed to be changed pretty quickly. I shared my chalk painting tutorial here so I am not going to rehash the process. But what I can say is that we did this project last March (!!) and have been living with it for a year and it's held up great! The only change I made to the original chalk paint recipe is that I used a different color paint. This is Behr's Rustic Taupe in the flat finish. It did NOT take much to totally transform this space. I've even had people ask if we swapped out the counter top- NOPE! Remember this is phase 1. I spent $4 on a tester size of paint for this whole vanity. Amazing right? I will add that we have since added pulls to the "fake drawers" and it looks even better! The pulls came in a 10 pack on Amazon. They are a warm chestnut color but they are a close enough match to the faucets for me to not even notice (I knew this when I purchased). I'll share the wall color soon and other updates we added in this space. But for now can we just admire how a little paint can go a LONG way?! I haven't stepped foot inside a grocery store since the middle of summer-- true story! Here is my brutally honest experience with these various grocery delivery services. I just about DIED the day I found out that Aldi grocery delivery came to my area. Truly Aldi is my favorite store. I am a real bare bones, don't like a ton of options shopping experience. Do I REALLY need to stand there and pick between 50 kinds of peanut butter?! Add kids to this mix and it's a mess. I love the ease of Aldi, how quickly I can get through their store, and how affordable everything is. It's the only place that I can guesstimate in my head how much I have spent, and my total is LESS than the number in my head. LOVE. I signed up for an Instacart account and got free delivery on my first order. I will say that I had a $20 off $35 purchase promo in my email BUT the coupon wouldn't work for me which was a disappointment. I DID have a referral code from a friend that gave me $10 off my first order. It was my first time using Instacart-- in my area you can also buy from Whole Foods, Publix, Costco, and Petco. I'll admit I like shopping at Costco (BY MYSELF- no kids)-- so I was new to Instacart's interface and the whole checkout process. After I picked all my groceries I chose my delivery day/time and then I saw "service fee". I assumed this was the tip (and if I had read the fine print I would have figured out it wasn't in fact the tip). THIS FEE CAN BE WAIVED, so take that off your order- wish I had known that the first time. I opted to tip my driver AFTER delivery. My first order was an hour and a half late which wasn't a big deal to me that particular day but it would have been frustrating if I had somewhere to be. They DID let me know the delivery was delayed through a text which I was appreciative of! Also it was the Thursday before Hurricane Irma (we were set to be hit Monday night) so I'm SURE traffic in and out of the store was nuts which is why I didn't fuss about the delay. My second order was SUPER fast- I ordered at 3:13pm and my groceries were at my door at 4:10pm! I got a random free delivery promo code for this order. Grocery prices are more than the store. I would however say that it isn't by much. AND you ultimately have to decide if you time is worth the cost savings. FOR ME (and this is totally just my opinion) planning my week to go in the store and come home frustrated by my kids or everyone else out and about ISN'T WORTH the $5 I would have saved in the store. My 1.5hours is more important to me. I know other people who LOVE to shop. I just don't. After the first free delivery you have to pay the delivery fee. They have an express option which allows you to pay upfront which is less than the pay per delivery amount. I was frustrated that I couldn't find how much this actually costs. It kept prompting me to start a 14 day free trial which I am not ready to do yet. From what I can tell there are multiple options but the only info I could find was $79/year (which seems HIGH to me- BUT broken down weekly/year it comes to $1.50/ week which is REALLY good. Just seems like a lot up front). They assume you will be home to receive your delivery. You can tell them in the notes section to leave it at your door, but they do NOT put your items on ice so I would definitely schedule delivery when you will be home. There is a whole list of FAQ here. Suggested tip: 10%+ You tip either at the time of delivery (I handed my driver the money) OR from the confirmation email you receive after the order is delivered. The bad- unless you sign up for their express payment option you pay for delivery. Also the sneaky service charge that can be waived. Organic food is hit or miss. Also if an item is out of stock, you are out of luck. You are stuck with Aldi's not amazing assortment of items-- BUT I justify this because at least I didn't have to make the trip to find out they are out of an item. I first started Amazon Fresh at the end of July. I received a promo for a free month of grocery delivery (usually $14.99). Because most people living have used Amazon Prime, I found the interface to be super easy and self explanatory. There were no hidden fees. Instead of seeing a "Prime" next to items like usual in Amazon, you see "Fresh" next to the fresh items. I also like that you can click on "Fresh" from the homepage and it will only show you "Fresh" items (almost like you are in a virtual grocery store). They have a "deals" section that I always like to check out and they USUALLY have a 1cent item each week. We have received 1cent yogurt, fruit snacks, rice krispie treats (this is a TREAT for my kids that I NEVER buy) and tiny apples this week! Amazon automatically separates the fresh items from your regular Amazon items (if you already have items in the cart). With their recent merge with Whole Foods, you are able to get the 365 Whole Foods store brand which is AWESOME! I have found their selection of organic items is awesome. My order was late once (I've used this service about 10 times). I contacted Amazon because honestly I was worried about my driver. He was an hour late at the point I contacted them. She assured me he was on his way and had 1 stop between where he was and my house. They offered to refund my whole order (!!) but I insisted that wasn't necessary so they gave me $10 off my next order. I REALLY try to have grace because they are doing me a HUGE favor and if they don't make money they are going to stop delivering!! He came about 30 minutes later. Minimum Order: $40 (once you spend $40 you get "free delivery" with the $14.99 monthly payment). The good- ease of Amazon's website, usually do a 1cent deal, and unattended delivery. The bad- I have yet to be able to order and receive same day. One or two things I have to wait for a delivery time another day-- which is FINE. But Instacart is almost always same day. So this isn't a grocery delivery service but it is worth mentioning. 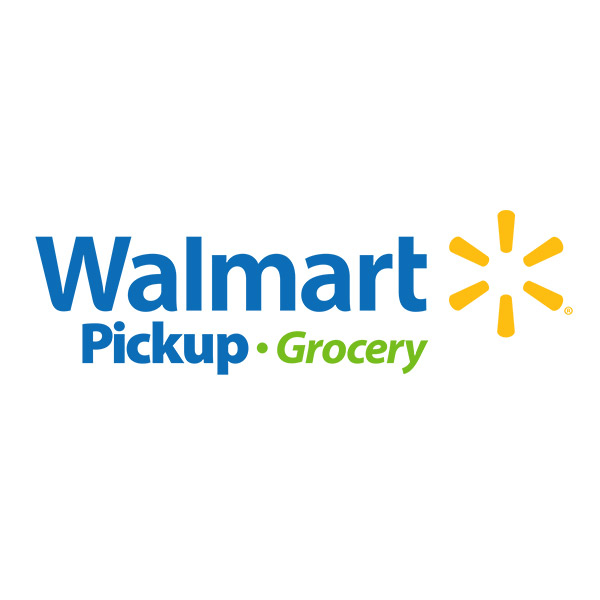 You can order groceries online, pick a pickup time and head to the closest Walmart that offers this service. The service is totally free and no tip is necessary. I have done this for over a year and I REALLY love this service. I did find that I had to plan my day around pickup time which is slightly inconvenient if you are not a plan ahead person like me. For the past year the nearest store to do this was about 25 min away with traffic. Within the last month, my closest store began offering the service so YAY! It's about 10-15min away depending. 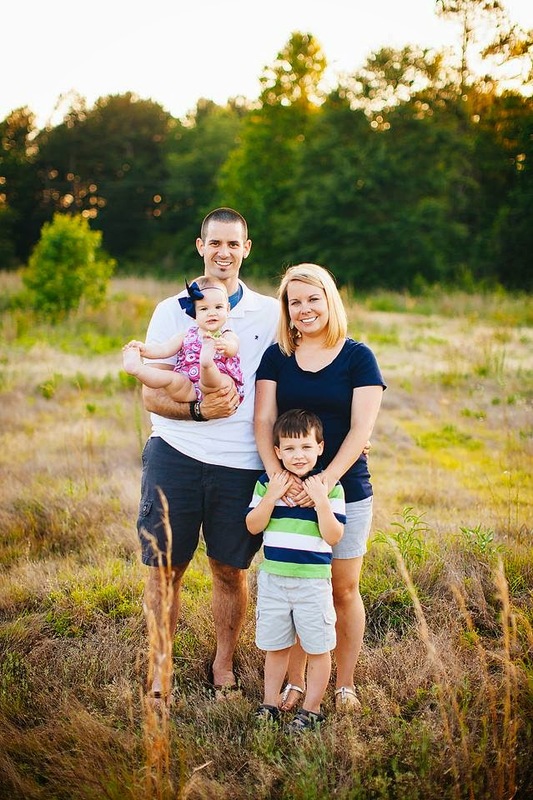 Definitely a great option for busy moms and dads who don't want to pay a monthly fee for delivery. -Prime Pantry: This service is for non-perishable food items. It is fantastic if you needed a quick restock of paper goods, pantry items and health/beauty goodies. I talked more about this service here. The gist of Prime Pantry is that Amazon gives you a box- each item you add to the box takes up a certain % of space and weight. Each item you click on will tell you what that percent is. Once your box is 100% filled you pay $5.99 to ship it. Except I've never paid $5.99 to ship! Because, hello I'm CHEAP. They will occasionally offer free shipping on larger items you purchase through regular Amazon. Pay attention to the different ways to ship before confirming your regular order. -Prime Now: You have to have the app to use. I am a fairly recent user of this service. The premise is you get the items within 2 hours. It is a limited stock of items and it's not always the best price- but it's FANTASTIC if I forgot something that is non-perishable (say body lotion or a bag of chips). It's a $20 minimum and $5.99 delivery fee- just like Prime Pantry I have NEVER paid a delivery fee because I get credits on other orders. I do tip. I hope that helps anyone who isn't sure of how these services compare! I am still honestly on the fence about sticking with one over the other. I think they work well hand in hand. I am leaning toward the Instacart Express ($79/year) because of how cheap Aldi is. But I can't get everything we always need from Aldi! Which is where Amazon comes in. So I am still undecided about sticking with ONE service. Of course if you live in an area where some or all of these service aren't available I am TRULY sorry. I have BEEN there. Once we lived in a small town where I had to travel and hour to get to TARGET.